This brings to mind William Davies’ excellent work about the weaponization of positive psychology (and wellness and yoga) in the workplace, and how the idea that you should “do what you love” can easily be turned against you by unscrupulous or manipulative bosses, and can lead people to take risks that are very unlikely to pan out, or make career and work decisions that are unwise. It’s a pervasive idea; according to some critics, it’s even what drives Pixar movies. Just as there may be more qualified people than there are positions for them (whether this is in the professions, or in the culture industry), so too is there a lot of great work out there that’s competing for readers’ and listeners’ and viewers’ attention. It’s easy for fabulous work to get buried, or never given a “fair” chance at finding its audience. Sometimes it takes ages for work to be recognized. And there’s always more coming. 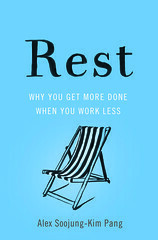 When I was in London this summer, I made a habit of going into bookstores and looking for copies of Rest. I was lucky to find them prominently displayed in some bookstores (Waterstones was especially good about putting it where readers were likely to stumble across it), but I was also struck at HOW MANY BOOKS THERE ARE IN THE WORLD. You’re lucky anybody ever reads you. Another problem is that it often assumes that creative work is a kind of titanic struggle involving unruly, chaotic forces. Call this the “agony and the ecstasy” model. In order to do good work, you have to allow yourself to be taken over by muses that are likely to disrupt, and possibly destroy, your life. In the end you might survive, and you might be famous; there’s even the very remote chance that both will happen. But “doing what you love” doesn’t have to mean living without boundaries, or entering into a race between creativity and self-destruction. One of the big lessons I learned from the people I write about in Rest is that some of the most successful, ambitious, and creative people work hard to put boundaries around their time and their work, and I sense they do this partly out of self-preservation, and partly out of strategic calculation. They recognize that they could enter that arms race, and some in their earlier lives did work that way. But lots of them recognize that their creative drive could just as easily drive over them as make something new. They also calculate that they’ll be able to do better work, for longer, if they don’t treat love and passion as things that have to be unruly, or impulsive. They treat love of their work as a river, not a flood— that is to say, a source of constant energy, rather than something that could drown them. Daily routines, rituals for starting and stopping work, and especially periods of deliberate rest play a critical role in channeling that energy. They make it possible to stop work, because you don’t have to worry so much that if you do you’ll lose the next good idea. They have the added benefit of creating more time and more opportunity for having good ideas, for actually becoming more creative and having a more sustainable creative life. Learning to not take rejection so personally, or other setback so personally, is another important kind of boundary-setting. Indeed, as I’m discovering, it’s just as essential. We think that the publishing industry’s business is to manufacture and sell books. And yes, it does that. But from an author’s point of view, what the industry mainly does is manufacture rejection. You know those stories about how Melville or JK Rowling got dozens of rejections, or how Zen and the Art of Motorcycle Maintenance was read by twenty editors before finally being accepted? That’s the norm. When we were selling The Distraction Addiction and Rest, I got dozens of rejections. Ultimately, though, all the rejections put together don’t matter as much as the one yes. In fact, selling a book is like dating. Yes, you get tons of rejections, people who don’t think you’re right for them, and probably a few jerks. But they’re not as important as the person who says yes. And maybe that’s an important lesson. Loving your work is like being married. Neither relationships nor creative lives (which is another kind of relationship) are sustained by impetuosity and impulse and self-destructive behavior. Both require a passion that is strong, but also steady. I think everyone can intuit that a couple who stays together for fifty years is more of a success, and has to develop and draw on different resources, than one who spends a wild weekend together then splits after a huge fight. Putting boundaries around your passion for your work doesn’t indicate that you’re not serious. It shows that you care. It shows that you’re in it for the long run.